previous: AM Palmer & Union Square Stock Co. EJ Phillips was almost 53 years old when she climbed Pike's Peak. This was on her second trip to California where she would perform in San Francisco for six weeks. After a prolonged journey of 24 hours we arrived here last Evening at a little after 9 o'clock. I wrote you on train at Cheyenne [Wyoming] - - telling you I had been to the top of Pike's Peak on Monday. When we started we did not expect to leave Colorado Springs until after eleven that night - but after our departure for the mountain, Mr. Palmer received a communication from the Rio Grande RR authorities that they would not be in working order for over a week - and they would have to transfer us over the Union Pacific to Ogden [Utah]. If we had not gone to Pike's Peak, we should have left at 2 PM. Well, I have been to the top of Pike's Peak, and I am not sorry for it. It was the grandest sight I ever saw. Had I known what a journey it was I should never dared attempt it - but I started thinking it was about four or five miles, but when I had been traveling about an hour up the narrow path, so narrow in some places that two horses could not pass each other - I asked the guide how far it was, and he told me it was 13 miles from the place where we mounted the horses. I was in for it, and had to make the best of it. The ascent takes about five hours, and the descent about three hours - the trail is over rocks, streams, hill and valleys. About half way up is a plateau of about 3 or 4 acres of level land. Here we were made to dismount to rest the horses - and take a drink of ice cold spring water. I felt pretty tired then, but as I did not want to spoil the party, I made up my mind to continue the journey to the top - about 15 minutes rest and we start again. Now the sun strikes us pretty hot & we all get nicely sunburned. We overtake a mule train and have to follow it a couple of miles before we can pass it - the path being narrow - and on either side very rocky. At last we dismount - we can scarcely stand - the air is so light - it makes everyone dizzy. My mouth was parched - froth settled on my lips. I was deathly sick, and for five minutes I thought my time had come. The guide helped me over the rocks to the signal service house - gave me a cup of very strong coffee without milk or sugar - and that revived me a little. I never felt such a strange sensation, sea sickness was nothing compared to it. Two enlisted men are stationed at the Signal Service house to take temperatures, currents &c &c. They must have a lively time of it in Winter. There is no vegetation on the mountain top - nothing but rocks - square as if they had been taken out of a quarry - carted and dumped there. They can be used for building without any cutting or blasting. The Signal Service house is built of these stones & nicely boarded inside. The house has five rooms: kitchen, dining room, sitting room and two bedrooms. A very large stove in the sitting room was kept red hot & a fire in the kitchen. It was very cold and snow fell while we were there. A photographer took a picture of the visitors who were there, some sitting, others standing among the rocks. If good we are to have some sent to us here. The fuel is brought on mule backs up the mountain - also food and anything else that is wanted - a start has been made to have a railroad built up. I suppose the endless chain is the kind intended but it will cost an awful amount of money to complete it. After we were rested, and had seen all there was to be seen for that day, we were taken back over the rocks to the horses. I felt rather weak but knew we had to get back, so got on the horse and began the descent, which was much more difficult than the climbing up. We reached the stables about half past six - feeling pretty sore and tired. Was the photograph any good? Did EJ Phillips ever get one? I keep hoping one will turn up. In the late 1880's, one of the tourists who visited the Pikes Peak Region was Zalmon Simmons, inventor and founder of the Simmons Beautyrest Mattress Company. 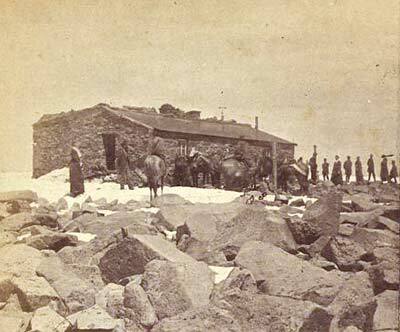 Mr. Simmons rode to the summit of Pike's Peak on a mule, partly to enjoy the view and partly to check upon one of his inventions: an insulator for the telegraph wires that ran to the Army Signal Station on the Summit. In those days, the arduous, two day trip on a mule was the only way to reach the top. Mr. Simmons was awed by the scenery but determined that the views should be experienced in a more civilized and comfortable manner. He was relaxing in one of Manitou Springs' mineral baths after his return, when the owner of his hotel mentioned the idea of a railway to the top. Mr. Simmons agreed with the concept and soon after set about providing the capital needed to fund such a venture.. The Knights Templar are part of the York Rite Masons. John Nickinson , the father of her children, and possibly her husband had been a Mason. See the letters of April 19, May 5 and May 12, 1893. Manitou and Pike's Peak Railway http://en.wikipedia.org/wiki/Manitou_and_Pike%27s_Peak_Railway Company founded 1889, limited service started 1890, more in 1891. Pike's Peak America's Mountain http://pikespeak.us.com/ Includes maps, trail information and historical photographs. next: Madison Square Theater Stock Co.